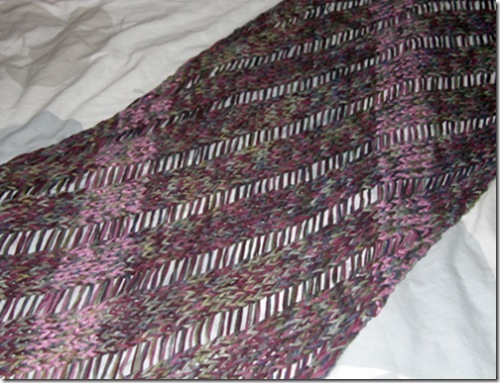 My version of Knitty's Clapotis. I made mine with #15 needles and 2 yarns held together, since I would never have gotten through it on the size 6 the pattern calls for. My one regret: I used Berroco Suede, and it friggin STINKS! I don't mean the yarn is bad to work with, I mean it actually smells bad. I usually love what this yarn company has to offer, but this yarn always smells like the machine making it had too much oil leaking out of it, and no amount of Febreeze will cure it. Washing actually made it worse. Bleagh.